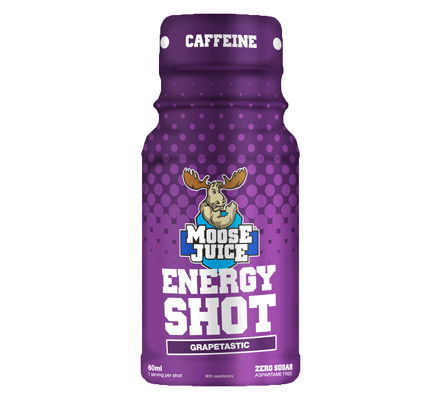 Moose Juice Energy Shot Grapetastic - ZERO sugar - Get a Boost from the Moose! Abracadabra! Moose Juice Extreme Energy Shots are packed with Moose magic (ok, caffeine) to give you extra energy and focus when you need it – fast. With added BCAAs and B Vitamins, our zero sugar, aspartame free shot of emergency energy is here to save you from being less than your best. Get a Boost from the Moose! (Allergens in BOLD): Water, Acidity Regulators (Citric Acid, Malic Acid), BCAA 2:1:1 (L-Leucine, L-Isoleucine, L-Valine), D-Glucuronolactone, Taurine, Caffeine Anhydrous, Preservatives (Potassium Sorbate, Sodium Benzoate), Flavourings, L-Carnitine L-Tartrate, Choline Bitartrate, L-Tyrosine, Sweeteners (Acesulfame K, Sucralose), Pyridoxine HCI (Vitamin B6), Niacinamide (Vitamin B3), Colour, (Allura Red), Cyanocobalamin (Vitamin B12), Folic Acid. Long term intakes of >10mg of vitamin B6 may lead to mild tingling and numbness.